It might be cold outside, but you can sweat off the pounds at Blueprint! Why not join us at Blueprint Fitness Personal Training situated in Whetstone between Finchley and Barnet in N20, North London? Our expert Personal Trainers can help you shed excess weight, build lean muscle, tone, and improve your strength and fitness levels in a program designed specifically for you. Find out more by calling us on 0208 4455447 or complete our Contact Form to claim your free consultation. Priorities - Weight training for FAT LOSS! Weight training will contribute to this as well as building a better metabolism ( helping you to keep your gains for life 😉) and of course, you'll burn way more calories!!! Reasons you gained weight overnight! 1. You ate out last night. 2. You had a stressful/ bad night's sleep. 3. You ate something different last night. 4. You ate or drank something with lots of artificial flavouring or seasoning. 7. You ate loads of carbohydrates. 8. You ate significantly more calories than normal. 9. Your digestion isn’t optimal. Your weight will fluctuate... and it’s important to remember that you are not necessarily gaining fat, but just weight (usually from water/food). If your goal is to drop weight on the scales, make sure to make a weekly average. This will take into account the random heavy and lower weigh ins. Also make sure to take progress pictures as the scales are not always going to show your complete fat loss progress. BOOK YOUR FREE CONSULTATION NOW if you are serious about losing weight and gaining lean muscle! Simpliest, Low Calorie High Protein Pancake. STOP YOUR WEEKEND FROM BEING A HUGE FAIL!!!! This weekend rather than call it a write off because it may not be perfect due to sociable commitments, how about you just try a little harder to stay on track. Be more mindful... maybe park you car a little further away for extra activity, get a green shake in to over compensate the lack of veggies you may have and have a protein shake before bed if you didn’t get enough protein in that day! Here’s two easy ways to keep your meal the same but change up your carb sources to lower your carb/calorie intake if this is a goal of yours. NOTE: if you then go and add lots of extra calorific sauces, side dishes or protein sources you may defeat the lower calories purpose of these alternatives. The Magic Fat Loss Pill? Some mid week real talk from the Team! The closest you will get to a Magic Pill is a Personal Trainer who lets you know there is no 'magic pill'! Instead it's about following a tailoredapproach, lifestyle change, putting in effort and of course consistency 💪🏽 To start your fitness transformation email us (email in bio above) to book your complementary consultation. Here is an easy snack to try that’s balanced, high protein, includes health benefits and tastes good! 0% Fat Greek yoghurt ( protein source , can mix your whey in for more protein) , Banana or preferred fruit (carbs), Flaxseeds (fats/omega 3s) 👌🏽 So simple and you can always blend it so you can have it on the go! Our latest Fitness Class Timetable is Published! Calling all Nut Butter Lovers!!!! Are you obsessed with Nut Butter or know some who is? Do you describe your portion as ‘a tea spoon’ of nut butter?? 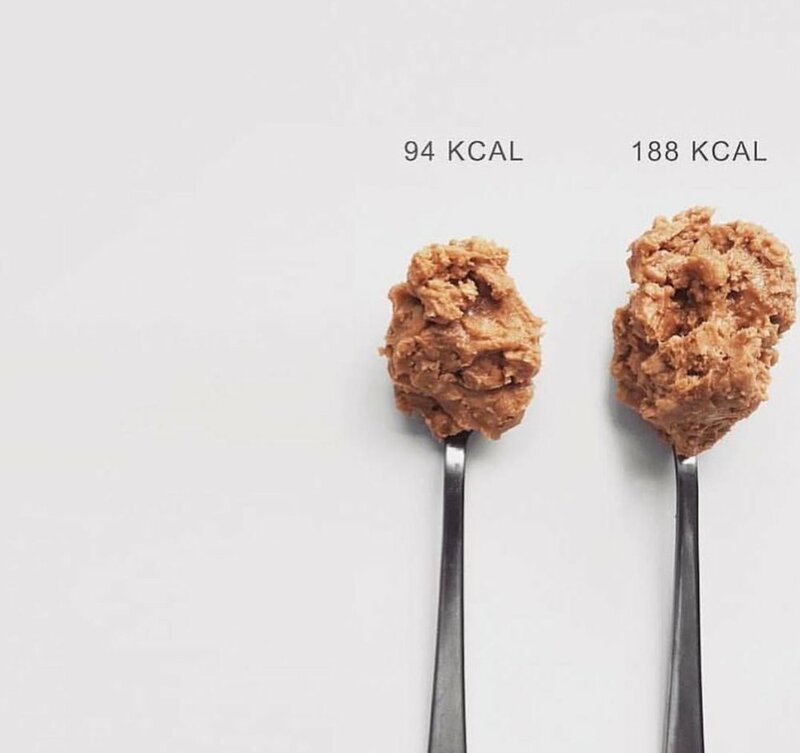 This picture shows how important it is to be accountable for your daily food intake if you have a physique goal... 'a tea spoon' of peanut butter isn't always good enough.